Opening the night for PRETTYMUCH’s Funktion Tour stop at Philadelphia’s Theater of the Living Arts on Saturday, November 3rd was Gunnar Gehl. He is a singer/songwriter and a major heart-throb. When opening up on the stage, all the fans screamed for him. His set list was a mix of upbeat and romantic songs. No matter what style he played, he had every person in the audience singing along. Gunnar had multiple guitars that he brought on stage to play and even jumped off a chair. He definitely got the crowd excited! After a short break, headliner PRETTYMUCH hit the stage. They are about halfway through the tour but are still as energetic as ever. Performing some of their latest hits like “Summer on You,” “Teacher” and “Hello,” the guys had their fans going wild. Consisting of members Zion Kuwonu, Brandon Arreaga, Nick Mara, Austin Porter and Edwin Honoret, some compare this up and coming boy band to One Direction. Simon Cowell is, after all, the creator of this band too. PRETTYMUCH calls Los Angeles, CA home, but none of the members are from California. Zion is from Ottawa, Canada, Brandon is from Texas, Austin is from North Carolina, Nick was born in New Jersey, and Edwin grew up in the Bronx. This year they have left their home to travel all around North America to put on a show for their fans. 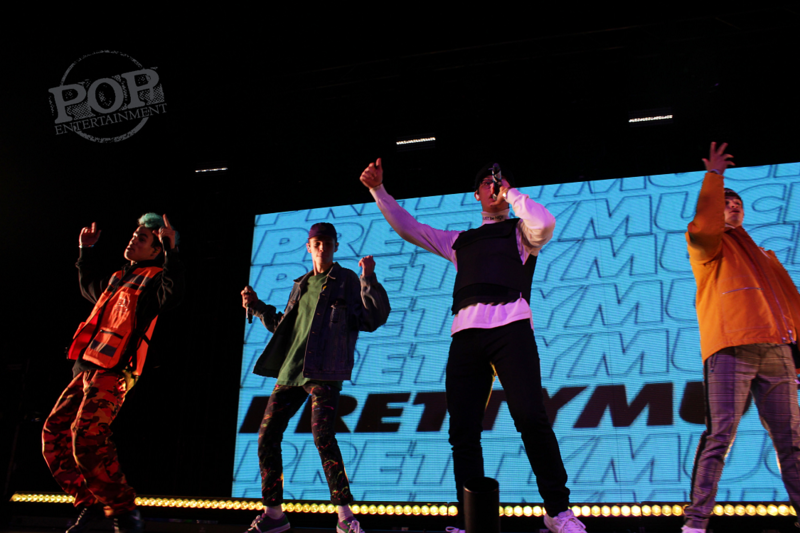 PRETTYMUCH’s music is in the pop genre and will make you want to get out of your seat and dance. All the fans in the crowd could not stop singing and moving while the boys on stage jumped around. When performing “Summer on You” they pulled a fan onto the stage to serenade her. She was stunned, her eyes glistened in the awe she had for the band members. Their energy and thoughtful lyrics made the show exciting for all ages. I really enjoyed listening to their music and watching their dance moves. Every song made me move my feet and put me in the best mood. Copyright ©2018 PopEntertainment.com. All rights reserved. Posted: November 5, 2018. Tags: Angela DiGaetano, Austin Porter, Brandon Arreaga, canada, Concert Photo Album, Concert Photography, Concert Photos, concert review, Edwin Honoret, Funktion, Funktion Tour, Gunnar Gehl, Hello, If I Ever Fall In Love, los angeles, New Jersey, Nick Mara, north carolina, One Direction, Ottawa, PA, philadelphia, Pretty Much, PRETTYMUCH, Real Friends, simon cowell, Summer on You, teacher, Texas, The Bronx, Theater of the Living Arts, TLA, Zion Kuwonu. Bookmark the permalink.